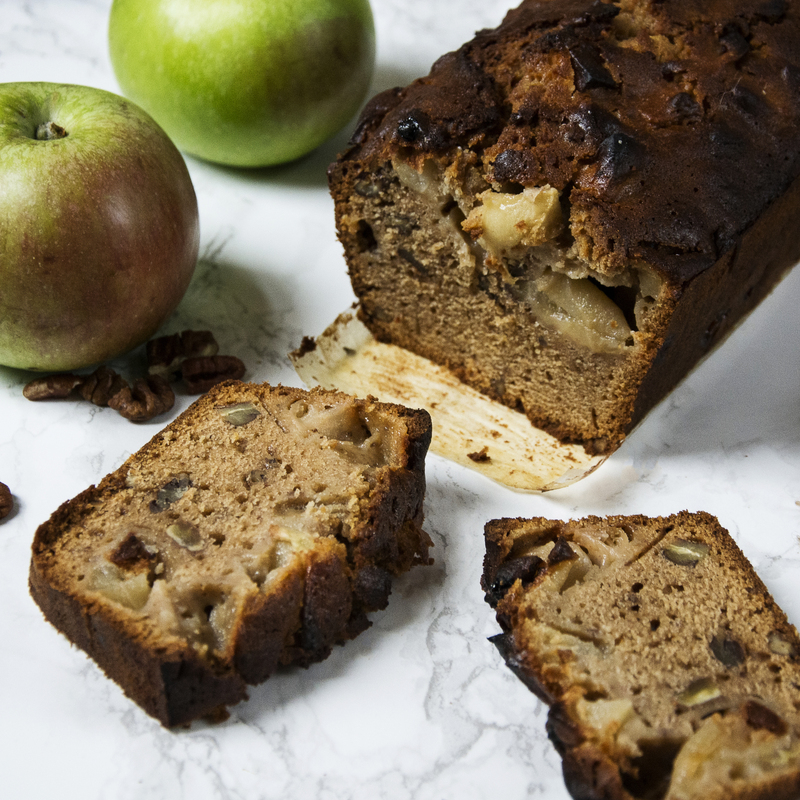 Spiced apple and pecan loaf. I love loaf cakes, I think they are one of the most underrated types of cake. They are so versatile and most importantly easy to eat and transport. They are perfect for an on the go breakfast, a mid-morning treat or even something to make the lunchbox more exciting. 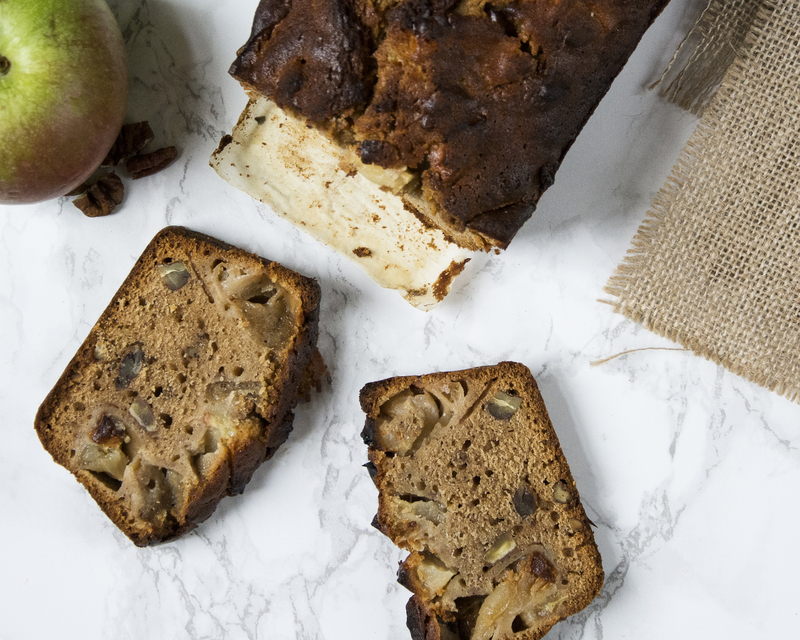 This loaf cake is spiced with ginger and cinnamon and has a sweet, tart apple and crunchy nuggets of pecans running through. Nature really had a hand in this cake recipe. The UK was recently battered by a storm and the winds broke off a lot of branches from my parent’s apple tree and blew off most of the apples so we found ourselves overwhelmed with an entire tree full of apples. After we made enough apple sauce for the rest of the year and baked an apple pie for everyone we knew we were still left with what felt like hundreds of apples. So if anyone has any more apple recipe suggestions they would be most welcome. Preheat the oven to 180C. Grease a 2L loaf tin with non-stick cooking spray and line with baking paper. Melt the butter in a saucepan and add the sugar and syrup, heat gently until all have melted and combined. Once melted, stir in the milk and set aside to cool. Sift the flour into a bowl and add the spices and baking powder. Make a well in the centre of the dry mixture and pour in the cooled sugar mixture. Stir gently until combined. Fold in the beaten eggs and add the pecans and apples stirring well to combine. Pour the mixture into the loaf tin and bake for 50 minutes or until a skewer inserted in the centre comes away clean. 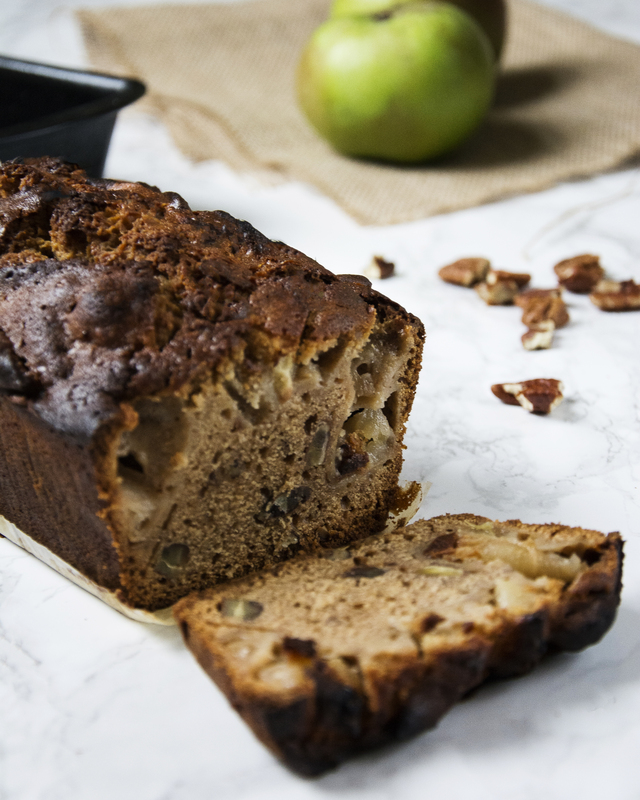 And there you have it, spiced apple and pecan loaf. If you give this recipe a try let me know how it goes by tagging @whatseatingmanchester in your social media post. Great. I’m more of a tray baker, though I am using my loaf tins more and more. Have you tried apple slice like the ones from bakeries?